Toronto, Canada, April 1, 2019 – St Kitts and Nevis’ Prime Minister Dr the Hon. Timothy Harris continues to mislead the people of St Kitts and Nevis at home and in the diaspora on the economy of the twin-island federation. At a Town Hall Meeting Sunday night, Dr Harris failed to tell the nationals that since he took over the reigns of government the economy of St Kitts and Nevis has decelerated or slowed down and is no where near the six percent GDP figure in 2014, even using the figures of the Barbados-based Caribbean Development Bank (CDB) figures. Dr Harris was dishonest when he also steered clear of quoting or making direct reference to the St Kitts and Nevis Gross Domestic Product by quoting the years 2013 and 2014 under the St Kitts-Nevis Labour Party administration of the Right Hon Dr Denzil L. Douglas. 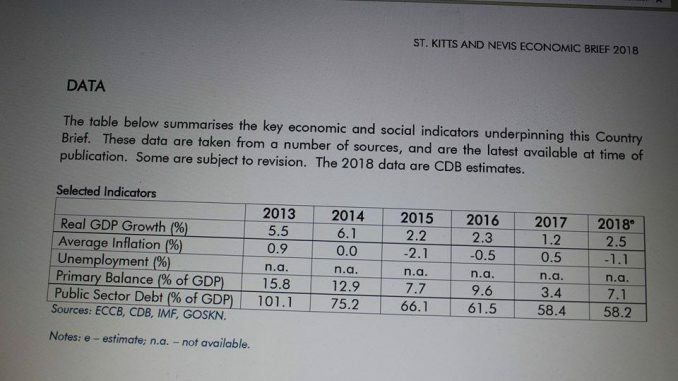 Even from a video of his remarks pertaining to the recent CDB Economic Review of St Kitts and Nevis for the year 2018, Dr Harris failed to quote the CDB figures for the year he has been in office. Prime Minister Harris, who is also minister of finance, steered clear of quoting the GDP figures to the nationals in Canada. He did not tell them that in 2013, the growth rate was 5.5 percent and 6.1 percent in 2014, the last two years of the Labour Government. The GDP for St Kitts and Nevis has never reached near three percent since Dr Harris took office in 2015. And he did not quote the CDB figures which showed that growth in St Kitts and Nevis decelerated under his leadership to 2.2 percent in 2015; 2.3 percent in 2016; 1.2 percent in 2017, with an estimate of 2.5 percent in 2018. St Kitts and Nevis is no longer the leading economy in the OECS and the Caribbean Community (CARICOM). The Barbados-based financial lending institution is on record of stating that the fastest growing economies were Grenada (5.2 per cent), Antigua and Barbuda (3.5 per cent) and Guyana (3.4 per cent).